I am a cryptogram fanatic. Occasionally I will buy a newspaper just to solve one. Certainly, I could buy a book full of them, but I don’t see the fun in that. I also like my crosswords and comics. I am a linguist. 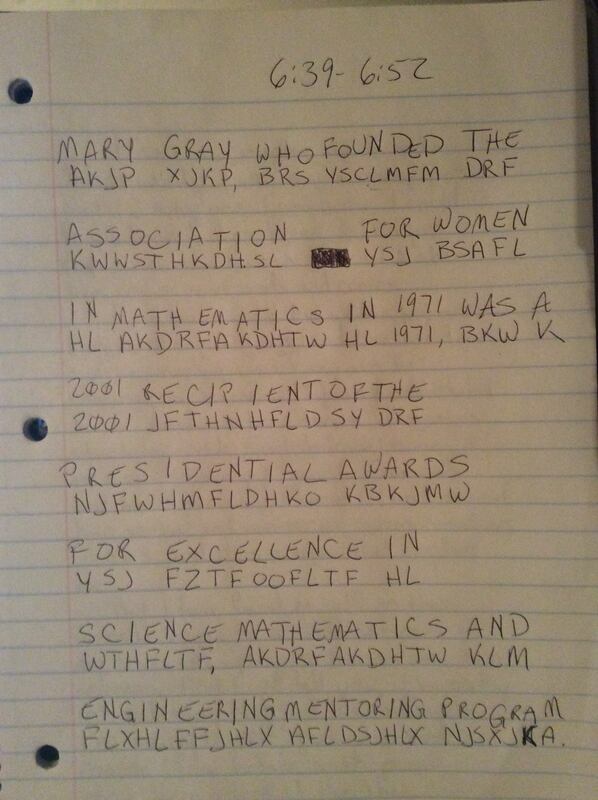 I’ve written my rudimentary language, and I’ve written a few cryptograms of my own to challenge my friends. I can speak, understand and communicate in several languages including but not limited to English, Spanish, German and Chinese. I know how verbal and nonverbal communication works and it is a topic that excites me. But I have found myself on this website engaging a different part of my brain, attempting to learn the computer sciences. And I will tell you; it’s pretty intimidating. Not just the challenges I’m facing myself, but also coming “face to face” with people much more adept at this than I. It had never occurred to me that I would find a cryptogram type challenge in an engineering program. Logic games, yes. But this, I am at home here. And what gave me the ego boost that I needed, in a community whose members eat, drink and sleep code while I struggle to apply my foreign language learning skills to learning Python, was a cryptogram challenge that is supposed to be hard. And I suppose that it is if your strengths are math and science. I imagine that if you find comfort in the absolute nature of numbers and logic, then the uncertainty of letters and grammar, whose rules are only dictated by their author, can prove daunting. So I took the NSA Crypto Challenge of Week 15. At first glance, it did seem like a LOT. The paragraph was a lot bigger, and the words a lot longer than the puns I excite to solving in the daily paper. Plus, the guy that posted the article, naturally HAD to be smarter than me! He scored 100% on MANY cybersecurity and cryptography certifications! And it took him two hours and thirteen minutes. Also, coming from NSA, what chance did I even have to complete it? Admittedly, I did not always complete my newspaper’s crypto quip. But I had a plan. And I had every intention of knocking a half an hour off of his time. I did it in thirteen minutes. The rest of my article I would like to explain to you how. Oh, by the way? That plan I was talking about? It just involved waiting until everyone was asleep and I had (two hours!) to myself. The first thing that you should know is that I did not read the article past the actual puzzle until I completed it. I did not wish to be corrupted by any of his answers or research. I wrote the entire puzzle out by hand in my notebook and filled in the letter “I” where it belonged. Newspaper cryptograms almost always give you at least one letter. I closed my computer at this point and searched for my second letter, not wanting to remember or use the second letter already provided. This is where a firm grasp of the English language comes into play. Whenever attempting to solve a cryptogram such as this, one of the first things to look for are common English word patterns. You are looking for letter patterns within the words and word patterns within the sentences. For instance, the author figured out the word “IN” because it was a two letter word that proceeded a year. It could have been a different two-letter word; there are plenty. But understanding English syntax would likely eliminate any other option. Another give away are single letter words. English has two: “I” and “A.” Again, knowing basic English syntax would prevent you from preceding a year with “I” as it is in this particular cryptogram. Another common pattern you’ll find, although not included in this particular cryptogram, but is important to know, is the “ABCA” word pattern. There are a handful of words that fit that pattern including “ELSE,” “ONTO,” and “HIGH.” Once you recognize the pattern, you can use the context of other words around it you might have solved, or see which letters might make sense elsewhere. Double letters are a familiar pattern. Often they are vowels like “OO” or “EE.” But they can be consonants like “TT” in “LITTLE” or “PP” in “POPPY.” An excellent way to determine which letters you are looking at is to look at the letter preceding or following the double letter. Consonants usually follow vowels. Vowels typically follow consonants. It’s just how English works. Except in the TWO examples I gave! Some apparent patterns to look out for are words that have apostrophes such as “YOU’RE” and “WOULDN’T.” Possessive words ending in “‘S” should also be looked out for. This particular cryptogram had one significant pattern that is easy enough to overlook: “TION.” Sometimes you have to leap of faith with these patterns. Sometimes you have to trust your instincts. I trust my instincts and leap. I had the “I.” I had the “N.” I probably had the “T” at this point. I honestly don’t remember how much of the puzzle I had completed when I filled this in. It was one of the first things I noticed when I looked at the author’s unfinished problem. I chose to wait until I found many of these letters on my own that I could before I used them. Some sentence structure giveaways that were not included in this puzzle but are good to know: If a sentence that begins with a two letter word, has a comma, then ends with a question mark mostly likely, that two letter word is “IF.” The word “SUPPOSE” with its double consonant often shows up in a paragraph that includes a question or statement that is qualified by the statement that is to be presumed. In the end, I found myself left with a proper name for which I did not have all of the letters. Fortunately, it was the same letter: “Y.” Of course, the author knew because part of his time spent solving the cryptogram was in this research (I assume.) This may work for him, but as I said in the beginning, it’s the linguistics that excite me. Finding the answers instead of solving them interferes with the purity of the game. Nevertheless, I chose the letter “Y” to complete the name AND the puzzle and checked the time and recorded it. THEN I googled the name. Several results in, I found the relevant article. That was good enough for me. It was complete. Please, dear reader, understand that I did not write this to have fun with the author. I wrote this with the hope that you and he will walk away with new skills that will make you a better crypto grammar! * I hope that you enjoyed it and learned something new! *I know that it is not a real word. But I like it.